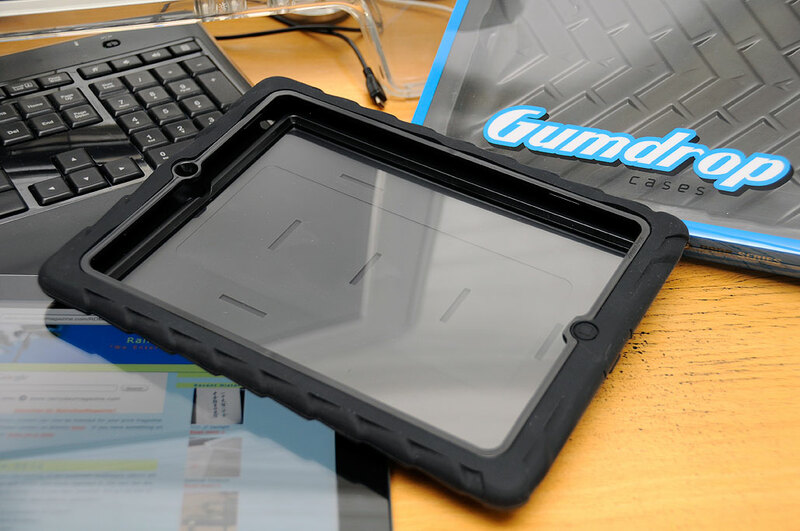 Yesterday we gave a FirstLook of the heavy-duty iPad cases from Gumdrop and Otterbox. Today and tomorrow we are going install the iPad2 in those cases and take them for a FirstUse. Gumdrop gear may be new to some, but we think we are going to hear a lot about them from now on. They make a number of silicone cases for the iPhones, iPads, and othermobile devices. The Drop Tech Series is the most rugged of the Gumdrop lines. The case consists of four parts: replaceable screen cover, front/back frames, a thick texturized rubber skin. The installation could not be any easier and went without a hitch. The front and back pieces fit the iPad precisely and snapped together perfectly. There was no movement of the iPad inside the frame. The rubber skin is designed to completely wrap around the frame. The fit was snug and, unlike thinner silicone skins and because of its thickness, unlikely to sag or deform over time. The only suggestion we have is to make sure both the inside of the front film and the iPad screen are clean. Any lint trapped between them will just bug you until you open things up and remove it. Okay, we are a little bit obsessive that way. However, because the skin is made of rubber, it will be a lint magnet. If seeing bits of white against the rich deep black back is going to annoy you, then you should consider Gumdrop’s Olive Green version. The extra thick rubber and the tread-like pattern made the iPad really easy to grip and feel very secure in hand. All of the ports, buttons, and openings are covered and well protected. We are happy to report that there was no loss of multi-touch response or sensitivity with the film on the iPad screen. In fact, we found the case to be really amazingly well thought out and extremely functional. After playing with the case for a day, the only nitpick we have is the following: because of the thickness of the USB port cover the home button does not depress well when the USB cable is connected. You have to press at a spot slightly below the button to get it to activate. This is not a common situation and we only mention it for completeness. We are happy to see another strong contender enter the heavy-duty protection space so long dominated by Otterbox. Don’t get us wrong, we are a big fan of those guys. However, when a new competitor appears, it ups everone’s game. We can’t wait to see what’s next! NOTE: While Drop Tech Series will protect the iPad from a spray or a splash, the case is obviously not waterproof.